Fraulein, you look so... hmmm, oddly supple? Strong, sure, but something about your cleavage looks... You know what, we're sorry for staring. We won't dwell on it. This traditional German beer girl is traditionally a women's costume, but we've decided that women shouldn't get all the fun of dressing up like your favorite Oktoberfest girls. 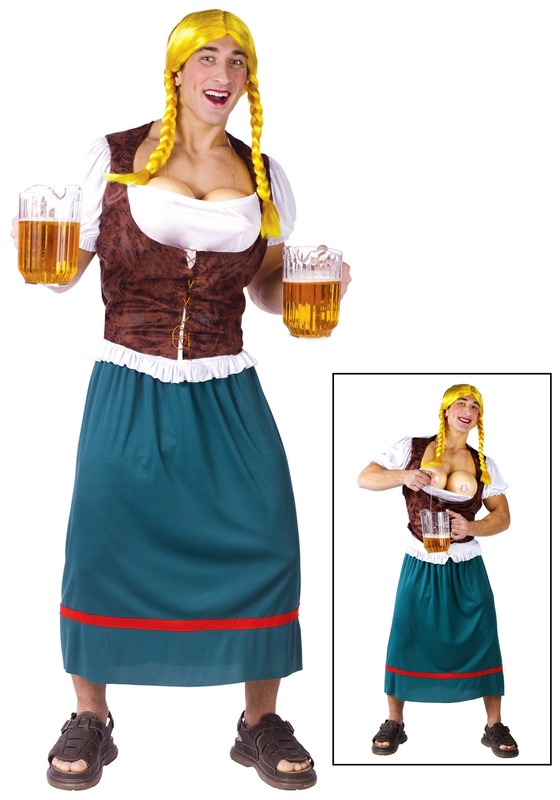 Besides, this costume lets the guys be both serving girl and bartender all in one. No need to even get up for a refill. Instead, just let your new favorite beer girl refill that drink from her (his) breast dispenser! Don't worry, no milk is added. You just get fresh beer in your glass (you will also probably get some very weird looks, especially if you're actually at Oktoberfest. Which is understandable, considering you'll be dressed as a woman and serving beer from out of your fake breasts.). But hey, you don't need to worry too much about where the beer is coming from. Just worry about guzzling that delicious German concoction down. And admire how good you look in that skirt and blouse. Haven't we always said you'd look great in pigtails? And now here you are, with those blonde pigtails looking absolutely ravishing. In fact, why don't you have a seat with us so we can get to know you better. Your beard stubble is simply hypnotizing. Why don't you lean in for a little- hang on... Hmm, we might be wearing beer goggles. Didn't realize how much we've had to drink. Wait, are you refilling our glass from your breasts? That can't be happening. Must be some really strong stuff. Oh well, you look great so let's have a kiss!